Compact design and high output Xtreme White bulb combine to provide maximum performance and versatility. Discover for yourself what a difference a little light can make. Piaa Xtreme Position Lamps are low profile and compact xenon halogen lights offering stylish accent and extra brightness to your driving vision. Super-compact dimensions allows installation in more positions, you'll appreciate the versatile mounting system. The mounting bracket uses the supplied double-sided adhesive tape or screws to mount the light virtually anywhere you'd like. Also includes the wrench to fasten the lamp to the mounting bracket, instructions, and all wiring and connectors. Use the parking lights, turn signals or headlights as the power source. Per Pair. Each measures: 3.94"L x 1.67"D x 1.0"W.
Are these fog lights original equipment manufactured? No, these fog lights are manufactured by PIAA. Many of our customers are able to install our fog light kit in a period of approximately 45 minutes to 2 hours. More involved installations may require drilling to position the lights where you want them. This kit includes mounting brackets that mount independently of the factory mounting points. The end result will be a clean look if done with care. For those uncomfortable with the install, have the kit professionally installed at a local car stereo shop. Will this kit fit my vehicle listed in the auction title? We have conducted extensive research and have sold hundreds of kits to customers with your same vehicle, with no fitment issues. 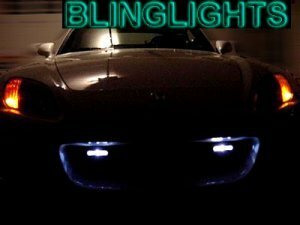 All shapes, sizes, types and color lamps in stock for all vehicles and aftermarket custom projects so even if you do not see what you are looking for please contact your friendly Bling Lights specialist. Does your kit include everything I need? Yes, our kit includes 2 lamp enclosures, PIAA Xtreme 5 watt bulb 168 wedge bulbs, fully adjustable mounts for bumper or bar, harnesses, pre-assembled wiring harness with relay and fuse, electronic switch, mounting hardware kit, installation instructions, and more. Can I hook the lights up to my factory light switch instead of the included switch? Of course, just run the wire to the factory switch for headlights, parking lights, fog lights or any other switch. An independent switch can also be added which you can get through us or Radio Shack. How do I pay by credit card? Once the auction is over an invoice will be emailed to you with different payment options including credit card directly over the computer. Payment over the phone is also available at the number listed on the top of this auction. If there is any problems making payment contact us so we can help. What is your return policy? You are entitled to a full refund less shipping costs if item is mailed back within 1 week of receiving item. Item must be in the EXACT brand new condition it was received along with the auction item number and reason for return. Keep the hat just for trying our product even if you decide to return. All shapes, size, type and color lamps in stock for all vehicles and aftermarket custom projects. Do not see what you are looking for? Please contact your friendly BlingLights specialist. Even if the wrong item was ordered Bling Lights will exchange free of charge.